Detail from Animal Farm book cover. Published in 1945, George Orwell's Animal Farm tells the story of a group of farm animals who stage a revolution and take over their farm. The revolution begins with principled idealism, but its pig leaders become increasingly corrupt. They soon turn to manipulation and propaganda in order to maintain power and control, and the farm becomes a totalitarian regime. With this narrative, Orwell creates a searing political allegory about the failures of the Russian Revolution. Fun Fact: Inspired by the cynical donkey in Animal Farm, George Orwell’s friends gave him the nickname "Donkey George." Old Major, an elderly boar living on Manor Farm, gathers all the other farm animals for a meeting. He tells them about a dream in which all beasts are free, and he encourages them to organize and rebel against humans. A few days later, when the the cruel and incompetent farmer Mr. Jones abuses the animals, the animals organize a revolt, led by two pigs named Napoleon and Snowball. They succeed at driving Mr. Jones off of the farm. Initially, Snowball and Napoleon work together. Snowball establishes the philosophy of Animalism, and the seven animal commandments (including "All animals are equal") are painted on the side of the barn. When Mr. Jones returns with some human allies in an effort to reclaim the farm, the animals, led by Snowball, drive them away in a glorious victory. The power-hungry Napoleon begins to undermine Snowball and eventually chases him away altogether. Napoleon slowly takes on the corrupt behaviors and habits of the humans that the revolution once opposed. Squealer, Napoleon's second-in-command, alters the commandments painted on the barn to reflect these changes. A simple-minded, hardworking draft horse named Boxer works so hard to support the revolution that he collapses. Napoleon sells him to a glue factory. The other animals are upset until Squealer, a skilled propagandist, convinces them that what they saw with their own eyes (the glue factory truck) isn't true. Life gets worse for the animals living on the farm. Meanwhile, the pigs move into the old farmhouse. They begin walking on their hind legs, drinking whiskey, and negotiating with human farmers. By the end of the novel, the animals can't tell the difference between the pigs and the humans. Mr. Jones. The incompetent and cruel human owner of Manor Farm. He represents Czar Nicholas II of Russia. Napoleon. A pig who becomes an early leader of the revolution. Napoleon is greedy and selfish, and he slowly abandons any pretense of revolutionary fervor. He represents Joseph Stalin. Snowball. Another pig who becomes an early leader of the revolution, as well as as the intellectual architect of Animalism. Snowball is a true believer who attempts to educate the other animals, but power-hungry Napoleon drives him away in order to consolidate power. Snowball represents Leon Trotsky. Squealer. A pig who serves as Napoleon’s second-in-command. Squealer is skilled at lying, creating altered historical accounts, and disseminating propaganda. He represents Vyacheslav Molotov. Boxer. A strong, powerful draft horse who is dedicated to Animal Farm and the revolution. He works himself to death for the cause. He represents the workers of Russia who supported Stalin. Totalitarianism. The revolution begins with principled ideas, but it is quickly co-opted by a power-hungry leadership. The pigs frequently lie and spread false historical accounts in order to increase their power. Ultimately, they rely on the ignorance of the masses in order to stay in control. Orwell uses this narrative to argue that without an informed and educated population, tyranny and despotism are inevitable. Corruption of Ideals. There are two kinds of corruption on display in Animal Farm. The first kind is the overt corruption of Napoleon and the other pigs, who become increasingly greedy as they acquire more power. The other kind is the corruption of the revolution itself, which loses any semblance of principle due to the other animals' worship of Napoleon’s cult of personality. The Power of Language. 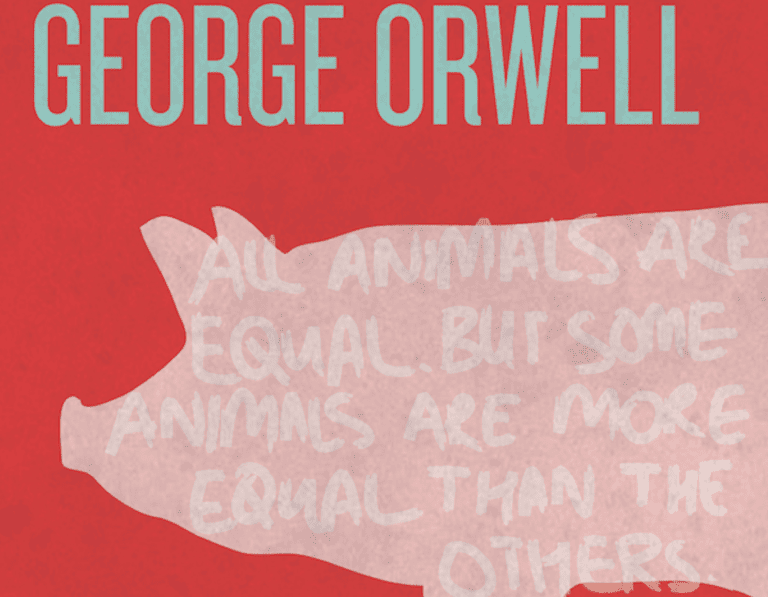 Animal Farm explores how language can be manipulated to control others. The pigs invent stories, spread false historical accounts, and popularize propagandistic slogans in order to remain in control of the other animals. Animal Farm is an allegorical novel about the Russian Revolution. Nearly every element of the novel represents a person, group, or event from the Russian Revolution. Within this political allegory, Orwell infuses a great deal of humor. His use of animals as stand-ins for historical figures sometimes has a comical, caricature effect (i.e. the representation of Stalin in the character of a pig). In addition, Orwell uses irony to demonstrate the ridiculousness of propaganda when viewed from an informed perspective. George Orwell was born in India in 1903 during the period of the British Raj. He was one of the most influential writers and thinkers of the 20th century and beyond. Today, Orwell is best-known for his novels Animal Farm and 1984, as well as his voluminous essays on politics, history, and social justice. Orwell’s influence is so significant that the word Orwellian is used to refer to anything that's dystopian and totalitarian in a similar way as the setting of 1984. Many of the concepts Orwell introduced have also entered the common vocabulary, including the well-known term "Big Brother."